Near an oval bay just a few miles from an abandoned McDonald’s, salmon are crossing a road. Twenty or 30 humped-out pinks flop into the dirt and then onto the tundra for no apparent reason. Maybe they made a wrong turn, missing their spawning stream. Or maybe they’re the betas, squeezed out of the water by stronger fish. The bay in front of us roils with fins. You could walk across them. They’re all pink salmon, which many Alaskans see fit only for dogs, but I have a perfectly good smoker at home. After four or five casts into the water, I break my rod trying to reach down for a fat, ocean-fresh fish. My girlfriend, fishing nearby, chivalrously offers hers. After four or five more casts, that rod, too, is in shards. Our friend and guide, Elaine, meanwhile, silently hauls in fish. Elaine used to guide bear-hunting trips on the Alaskan mainland. She didn’t like the work. “It was more like babysitting,” she says. A former shareholder in the Aleut Corporation, a for-profit enterprise owned by native Alaskans, she now holds multiple jobs: store owner, city council member, salmon harvester. There’s remote. There’s wild. And then there’s Adak. An unbelievable place in the literal sense of the word. The name stems from the Aleut for father. The Aleutian Islands, created thousands of years ago by volcanoes that still belch, reach from Alaska toward Russia in a scimitar-like curve, separating the Bering Sea from the North Pacific. Adak Island sits near the end of the line. Its namesake town, set in a natural harbor, is the most westerly municipality in the United States. Russia is just 750 miles away, a proximity that explains the military presence. The Navy housed a station here during World War II, and later it became a Cold War surveillance base. The Navy began leaving in the mid-Nineties, and the Aleut Corporation eventually took over much of town, offering houses to its members for next to nothing. Not many took the offer. Elaine did and, voilà, there it was: an untenanted land of caribou, rugged peaks, tundra, abandoned spy buildings, and unexploded military ordnance. A place to tread lightly. We arrive on a whim. My girlfriend is Alaskan and has visited Adak before. Her pitch went something like this: Caribou are everywhere, the fishing is great, there’s an abandoned McDonald’s, and you can sometimes rent a fire truck to drive around in. It’s weird. I was sold. Our lack of camouflage stands out on the government-subsidized 737 flight from Anchorage, which flies in only on Sundays and Tuesdays. Visitors to Adak these days tend to come in two varieties: caribou hunters and military contractors. The former attempt to thin a herd that was introduced in the 1950s, whose numbers have since exploded due to the lack of natural predators; the latter clear unexploded bombs from the north side of the island, which was used as a test range during the Cold War and where hiking is not advised. We land in a fog and step out of a small airport to see identical blue roofs stretching down to the sea, a shipwrecked boat in a bay filled with PCBs from old military ordnance, and the McDonald’s, which has a drive-through with faded signs promoting, appropriately enough, the original Jurassic Park. The homes are one or two stories, with square lawns and straight driveways, the remnants of postwar American dreams. Now the driveways are empty, the lawns are overgrown, and the windows are dark or crashed in. A few shining trucks navigate the silent maze — the Navy contractors. One such man we meet likens Adak to “prison.” Adak isn’t prison. It is, rather, an America lacking any semblance of law and order, flatscreens, and football — a wild reclamation project and testament that, given an inch, nature roars back. Here you can fill ziplocks with nagoonberries, sweet fruits of the tundra that do well inside pancakes. You can watch sea otters, their population once decimated by Russian fur traders, playing in empty bays. You can search for doors in old spy buildings. You can open a dumpster outside the only restaurant in town — a good Mexican joint — to find the recently severed head of a bull caribou. 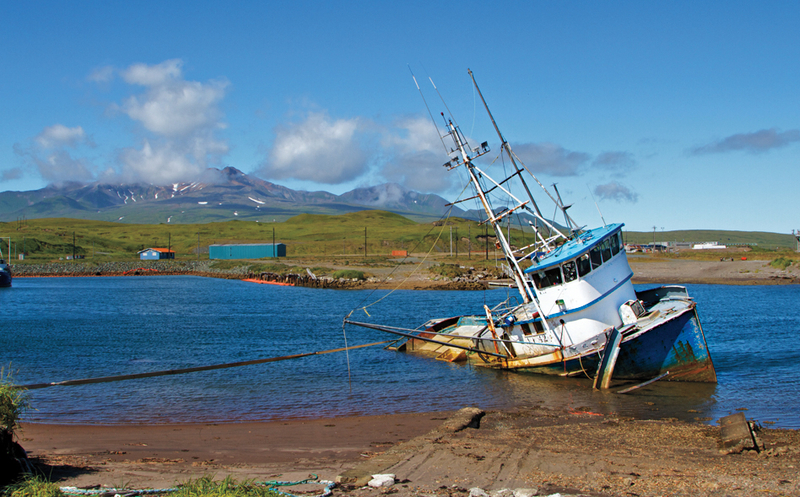 You can leave town, walk west, and discover a pristine lake feeding a stream that empties into the Bering Sea. We camp on the shore of the lake for four days, following a strict schedule that goes as follows: Wake up. Walk to the river at the edge of the sea. Catch a salmon. Cook it. Walk over a small mountain to another bay. Catch more salmon. Walk back. Observe the volcano to our west in the setting sun. Repeat. One day, while casting to bright, eager Dolly Varden trout in a three-foot-wide stream, we look up to see guests: the herd of caribou, cutting through the fog, lunching in the tundra. Upon our return to town, Elaine takes us fishing, then hosts a salmon-smoking gathering at her place. A few friends join in, including one of the only teenagers on the island, a dreadlocked kid named Freedom. Beyoncé blasts through the house — music being one of the few cultural connections to the Lower 48 — and the conversation turns to a long-lost treasure hunter whose corpse was recently found in a hole in the tundra. Elaine serves caribou sausage while Freedom plays video games on his phone. I wonder about all those broken windows. If I were one of four or five teenagers living in an abandoned naval base 500 miles from the next high school, I might break some windows, too. Or maybe it was the wind, which regularly hits 120 miles per hour. On our last morning in town, my girlfriend and I borrow an old bass rod and rig it up with my fly reel. We head to another stream at another beach. After a few minutes, large gray shapes begin to dance in the waves just offshore: The silver salmon run is coming in. I start to cast, hurling a blue fly as far as I can with the jury-rigged setup. The line pulls taut. Rather than reel in, I just play the fish until it slows a bit, which takes a long, long time. Eventually I start to walk backward, pulling the coho toward the beach. A shadow fills the sky — our plane, arriving to take us back to the world. I take one more step back, the line goes slack as fish hits sand, and there, on the beach, flails 10 pounds of wild silver salmon. My girlfriend rolls it up the sand, pops its gills, and bleeds it out. We fillet it, throw it in the cooler, and sprint to the plane, covered in sea salt and fish guts and laughing aloud. Getting There: Alaska Airlines has two weekly flights, both in and out of the island, on Sundays and Tuesdays. Where to Stay: Little Michael Lodge, from $175 per night. What To Bring: Bombproof rain gear — it’s nearly impossible to avoid a downpour. And if you’re fishing, bring an eight- or 10-weight rod — as well as a backup, just in case yours breaks like ours did.